We all love and relish grilled foods especially during the outdoor parties in the spring season. If you are planning a tailgate party with your buddies and intend to serve a wide range of grilled snacks like hot dogs, hamburgers, grilled veggies, etc. then your basic requirement is a portable gas grill along with setup. An amazing portable gas grill can make your tailgating successful and your friends will love to come to your home again and again. While electric grill requires a consistent electrical connection, which is not possible outdoors, the charcoal grill can be tedious with a large amount of smoke that can spoil the fun. A portable Gas grill is the easiest option for tailgate parties as they are highly versatile and easy to use. Here are some of the best portable gas grills for tailgating. Whether you plan a tailgate cookout or a weekend trip or picnic, you can enjoy grilling various delicacies on a portable gas grill, which is great due to its flexibility, convenience, and compact design. They are very easy to clean as compared to charcoal based grillers. However, you need to plan before purchasing the right grill so that when you are camping or tailgating, you don’t have to worry about the size or weight of the grill. Temperature control: If the portable gas grill has one burner then it has only one temperature control, but if there are two burners in the grill then it has two temperature controls, which can help adjust the temperatures accordingly. Temperature control of the grill can make cooking easier and tastier during tailgating so consider buying a gas grill with temperature control. Large surface area for cooking: When cooking and grilling on a portable gas grill, you will require a large surface area that helps in cooking evenly from all sides. If you need to cook for about four people, then you must choose a grill that has a large cooking surface area so that food is cooked faster and evenly for the group during tailgating. A number of burners in the grill: if you need to cook loads of food at a single time with a combination of meats and vegetables then you require grill with more burners and different temperature setting to receive best results. One burner may not be enough for a large group and for cooking different types of foods so opt for a gas grill with two burners. However, if you only need to grill burgers and hot dogs, then one burner will be sufficient. 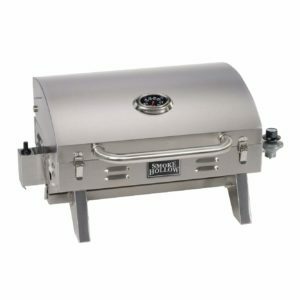 Try to buy grill that has burners made of stainless steel, brass or aluminum. Grates of the gas grill: Panels that are fitted across the surface of the grill are called grates and they are a crucial part of the cooking area. They help in keeping the heat intact in the cooking area and play a major role in grilling. Grates are made using different materials like cast iron, stainless steel, chrome or nickel. While cast iron and stainless steel are the best to use, chrome and nickel grates do not hold too much heat. Choosing a gas grill with a good grate is vital. Ignition: The ignition system of the gas grill mainly has the spark ignition system and it may run with friction through the pushing button, a battery or a dial to attain a spark. However, in case the starter does not work, a manual ignition hole is also installed on the side of the grill. Construction quality: It is very important to consider the construction quality of your grill and to check, how well it is constructed and whether it is durable enough to be taken on adventures and travels. The grill must be stable enough and should be safe during cooking so that no mishap happens when you are grilling on the stand. Grills that are constructed using materials like cast iron, cast aluminum, stainless steel, and enameled steel are best in durability. Portability: Portable gas grills are easy to transport and great for cooking during tailgating or traveling. Portability of the grill depends on its size and heaviness; as if a grill takes up too much of space, then it will not be very practical. A too much heavy gas grill can also be a problem as it will be difficult to carry from one place to the other. A number of shelves: Shelves in a griller are quite helpful as they act as the preparation area to put the meal together and hold all the condiments together. Consider buying a gas grill that has side tables or shelves as it will be more practical and helpful. Fuel cylinders: Portable gas grills mostly have a small size propane cylinder which makes them easy to transport. While some gas grills have adapter hoses that connect the grill with a larger propane tank, some have fitted in the cylinder. You can choose the one according to your requirement for tailgating as if you have a large group then you might require a 20-pound propane tank. Easy to assemble: You don’t want to spend a long time assembling the grill when you need to set it up so choose a grill that is ready to set up out of the box. Complications while setting up a grill makes it stressful, so it is crucial to choose a grill that does not require much time to install before the party or tailgating. Accessories with the grill: Various accessories are available with portable gas grills that can help you with the cooking. Keep a check on whether you are getting accessories like adapter hose, cover for grill, grates, girdles, etc. with the griller; otherwise, you might have to purchase them. BTU rating: BTU or British Thermal Units are used to find out the output of gas that is required to heat the grill. The higher the BTU, the hotter will be the temperature. BTU rating of a grill indicates the maximum amount of heat available in the main area of the griller. There are numerous grills available in the markets that have various types of features, and it is very difficult to find the right one that is apt for your tailgating. Get cooking and grilling with Coleman Propane portable grill which is ideal for picnicking, camping, tailgating, or traveling. The grill delivers 20,000 BTUs of heat on the grilling surface that extends up to 285 sq. inches. No need to carry heavy and bulky grills anymore as the Coleman Roadtrip LXE Propane Grill is easy to set up and use. It can be folded, rolled up or set up within seconds and has a lift and lock system which makes it easy to use. The grilling surface has been designed with cast-iron, which is quite durable and provides a large surface area with even heat distribution. It has an interchangeable swap top which helps you to switch grill grates for stove grates. It has an instastart button so you can ignite it without a match or a lighter. Coleman Roadtrip Portable Grill can be folded down and kept in the trunk of your car. The griller has two independent burners with two temperature controls and it can be transported with great ease. It has one propane cylinder that can cook for one hour straight with 16.4 oz. of propane and burners have 20,000 BTUs of power, 10,000 BTUs on each burner. The grill is easy to clean with a removable grease tray, cast iron, and porcelain coated surfaces. There is a Perfectflow Pressure control system installed in the grill which provides steady heat. Food is grilled perfectly with minimum oil required due to the non-stick surface. Can be transported with ease as it can be folded. Get amazing grilled flavor in your cooking with the use of this compact gas grill which is high in performance. It is a convenient grill which can cook large amounts of foods for large groups. It heats up quickly and helps you cook great meals anytime and anywhere. Surface area for grilling is 145 square inch, which can cook a large number of foods in one go. Burners are made using stainless steel and have the power of 5500 BTU and the grate is porcelain enameled for even-heating. It has aluminum legs and stable feet and can be set up quickly. The lid has a lid lock to keep it secure. The carrying handle is designed in briefcase style to carry it with ease. It is a portable grill that can be taken anywhere and is perfect for RVs. The temperature may rise too much to keep a control on it. Now you can show off your grilling expertise while tailgating, camping trips or during picnics with Coleman Roadtrip LX Propane Grill. You can prepare a great variety of foods like grilled veggies, burger, hot dogs or steaks. The grill has an interchangeable design so that you can change the grill grates to stove grates and make use of InstaStart ignition to light the burners without the use of matches. There are two adjustable dual burners that have 20,000 BTUs of heat. This gas grill has a portable stainless steel table top that is perfect to grill while on the go. The griller is well constructed and helps you entertain guests with outdoor cooking wherever you want. It has a compact design with folding legs and a locking lid so that it can be transported or stored with great ease. It looks attractive and is convenient to cook delicious meals which you can serve your family and friends. You will get a wide surface area for cooking which about is 305 sq. Inches and the grill can be set up easily without much hassle. Cleaning the grill is very easy and the temperature can be easily monitored with the mounted temperature control. Construction of the grill is wonderful and assembly is quite easy. Have a great time during tailgating, camping trips with this grill as it has a collapsible and portable design with great convenience. There are two adjustable burners that produce heat of 10,000 BTUs of heat and you get great amount of power and heat to cook a wide variety of foods from vegetables to burgers or steaks. The Swaptop has an interchangeable design so that you can change grill gates with a stove top or a griddle top. There are sliding tables on both sides of the grill so you can keep utensils and ingredients handy. It is easy to set up and fold up so you don’t have to worry about the assembly of the grill. The grilling surface is 285 sq. in. We have listed the portable gas grill models on the basis of bestselling and innovative designs. All of them have different features and you can choose yours depending on your preferred cooking style and budget. Try cooking healthy and fun meals using these gas grills or host a party with your family and friends in your backyard.